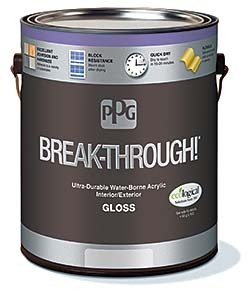 Waterborne Break-Through!® dries in 15-20 minutes and offers improved adhesion to substrates such as ceramic tile, fiberglass, and laminate. The paint functions as an interior and exterior product, with early block resistance that provides tack-free film. The paint is available in a number of ready-mix colors and in nearly 2,000 colors from the Voice of Color® palette, as well as in 100 more colors in the Atmospheric collection. Paints are available in satin or gloss finish.